In the blink of an eye, April of 2018 has already passed. As my teacher said, three to four months before graduation are the fastest time in the four years of high school, because with the arrival of the graduation ceremony, more and more preparations need to be completed by us, and there are also Preparations for the future, such as university applications, scholarship applications, etc. After ushering in the last snow in the spring of Halifax, the spring of Canada slowly came. Although compared to the weather in the hometown, NS was mostly spent in April in cloudy weather, accompanied by light rain at night. The temperature is maintained between 8-15 degrees Celsius, so the temperature is very pleasant. Let's talk about what happened this month. 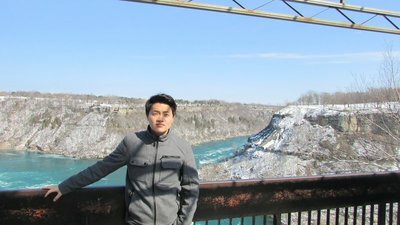 As an international student in the NSISP program, we have organized activities every month to break the classmates. 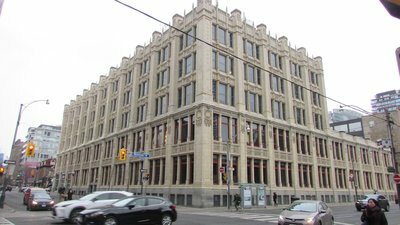 Our regular study and life will allow us to integrate into Canada more quickly. Therefore, April activities are more desirable to me. 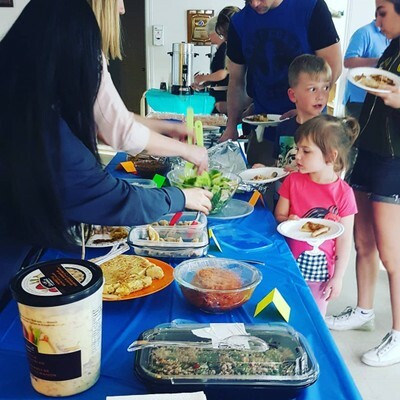 The international potluck is that each student makes a representative food from his hometown or country, and then all The classmates gathered together to share these foods. As me who loves to eat good food, this is nothing more than a very good opportunity, because many international students around me are able to make very delicious food, so I am very much looking forward to this time. Activity, of course, although I am not a professional chef, I also hope to share my food on behalf of my hometown, so With the unremitting efforts of my friends and I, we finally produced a more authentic Chinese dim-sum-- Custard Bun. 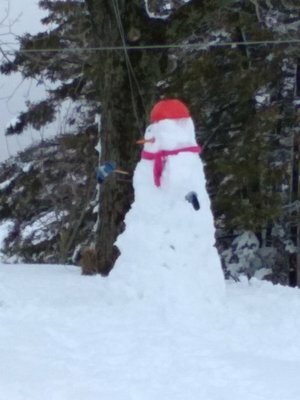 Unfortunately, when I think I haven’t photographed him yet, the custard bun I made is already gone, so everyone may not see what it looks like. So, the picture of the paper that you have just seen on top is one of the most important things that happened to me in Canada so far, but before I talk to you guys about it I would like to start introducing myself. Before I came to Canada I was always about sports and I am still. All the kinds of sports I've already done, I would not be the best of it in each one, but I use to be at least good. Differently, from Brazil, Canada values a lot more the sports interaction with the teenagers and my dream was to come to a country like Canada that gives a fair value to the sports and cares about people who practice it. North American movies that showed the high school sports, such as "High School Musical" and many others, were my picture of what Canada was like about sports, and it is not exactly the same but even better, so finally, I had the chance to come to Canada and live the best experience of my life with no doubts. Being a stranger, even though Canadians are the most welcoming people in the world, is a bit hard to fit in the world of sports here, you have to challenge yourself and challenge everybody to respect and be respected, so then you have your own space. I believe that I tried a lot to be known by people and to be the best as my dad and mom always taught me to do, it was hard, but pleasant and rewarding. I am not going to say that I deserve what was given to me and I have no clue about how to thank everyone that made it possible. It is still unbelievable. 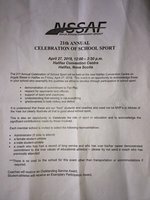 So that you finally understand, I was chosen to be the male student-athlete at Middleton Regional School to receive an Exemplary Participation Award in Halifax on April 27. When I received that invitation, I got really emotional and cried of happiness because I never expected to receive such an honored award like this. I mainly wanted to write this blog to thank Paul Millman, the Executive Director of NSISP, Michael Rosson, the Assistant Executive Director of NSISP, Monica Nielsen, Coordinator of the Foreign Correspondents of NSISP, Lorna Mastin, my homestay Coordinator, and my parents Carlos and Daniela Caram, to make my experience come true and the best that it could be. Special thanks to Vice Principal Mr. Greg Bower, Principal Mr. Jim Gushue, all Middleton High School teachers that supported and chose me to represent Middleton and my two host families, Danny and Cherie Townsend, Joe and Helen D'arcy. All of them helped and still helping me with everything I need. Thank you, hope you have a good one! See you in a next blog! 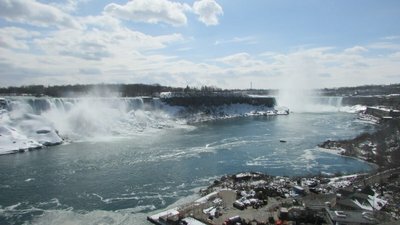 March break is a time most of people want to relax and take a break from winter. Some of them go away from home to travel warm countries, for a ski trip or to travel other places in Canada. 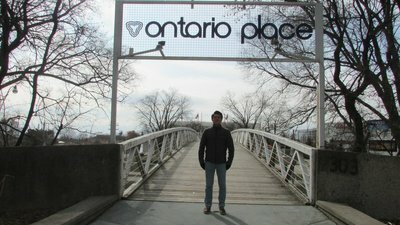 One of my friends from Mexico and I decided to go visit his uncle in Toronto. We were very excited to go to Toronto because we were sure it was going to be one of our best memories in Canada. 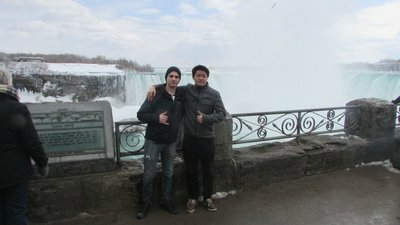 Especially my friend was very excited because he had not been to other places in Canada and Toronto is one of the biggest cities in North America and he had not seen his uncle for a long time. We arrived in the airport around 11 a.m but our flight was leaving at 9 p.m. We had to spend the whole day in the airport. It sounds very tiring and frustrating but we were too excited and happy to feel tired and frustrated. Though, it was not easy to stay 12 hours in the airport. 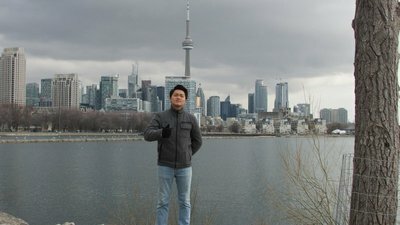 We got in the plane and finally arrived in Toronto around 11 p.m. My friend's uncle was waiting for us in the airport and we started heading to his place. We had really good talk that night but had to go to sleep early because we were very tired and we wanted to get up early in the next day to go see Toronto. 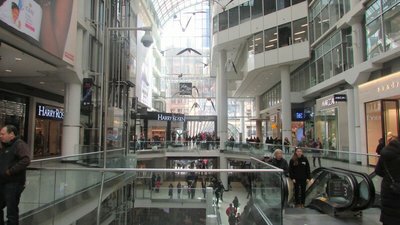 We got up around 8 a.m to get ready and went downtown Toronto. My friend's uncle said that, since he has work through the week, he would not be able to drive us everyday. So what he did was to show us around the first day and taught was how to use buses, subway and streetcars. He even bought week passes for us. 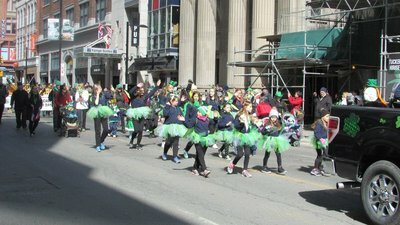 We went downtown Toronto and there was a huge parade going through the whole city celebrating St. Patrick Day. 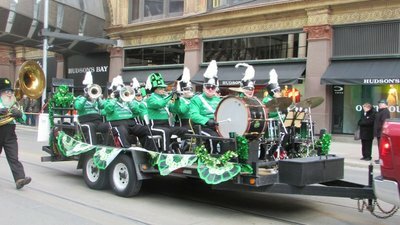 It was bigger than any other parades I have seen in my entire life. People were playing instruments, dancing and singing. I wish I was one of them. 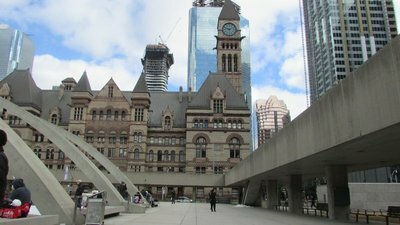 Then we went to see the old city hall and public outdoor ice-rink. 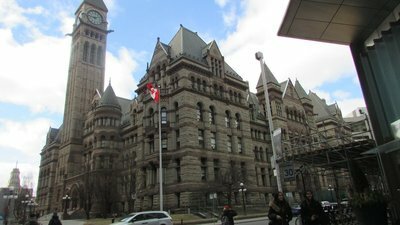 The old city hall is a really beautiful and gigantic building. Also, I was so impressed that people were still enjoying skating a lot outside on the public skating rink. 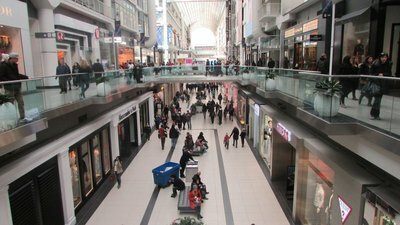 After that, we went to the mall in downtown and walked around for a bit. We could not see the whole mall because it was too big. It was so much bigger than we expected. 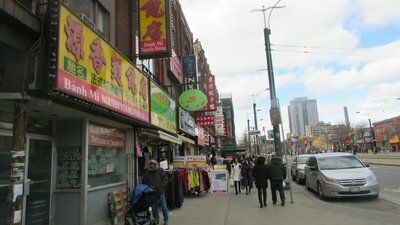 Then we went to China town in Toronto. 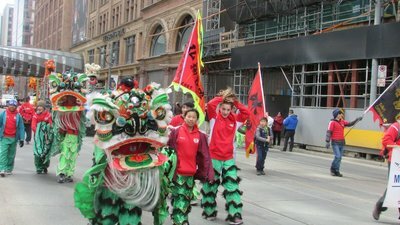 I realize that Toronto is really multi cultural place. China town was tremendously big and there were also a lot of people. 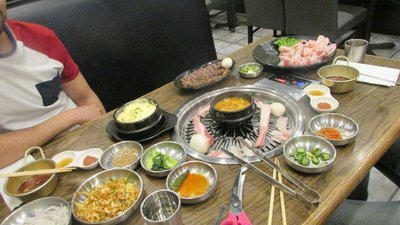 We got really hungry since we walked a lot that day so we went to a Korean BBQ restaurant. Finally we arrived home and took rest and planned for the next day. We thought It was a great start of our journey. We woke up early to catch the bus at 9 a.m we were a bit tired but we were still so excited to go to Ontario place and a big park by it. It was really beautiful there. It has really stunning view. 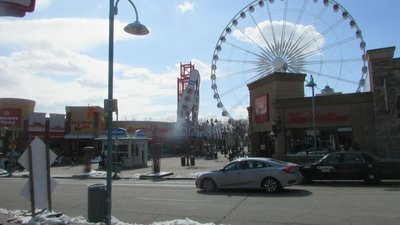 We did not want to leave that place but we had to because our next move was to go to the CN tower which is really close to the park we were in. 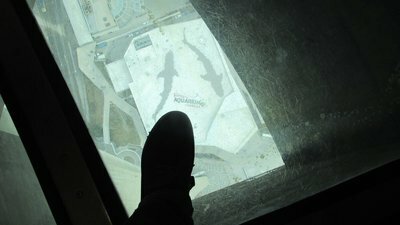 We went up to the observation of the CN tower. We could look down the whole city. Of course it was beautiful and we realized again how big the city is. There is a higher observation called the " sky pot ". 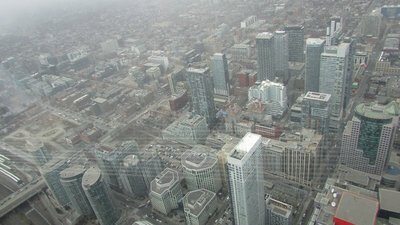 It was free for us to go up there so we could look down the whole city from the higher level. We came out of the tower and my friend's uncle picked us up at the old city hall. We were happy that we did not have to go back home by subway and bus. We went home, had really good supper, watched a movie and went to bed. 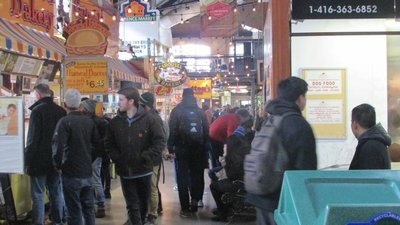 We were in hurry in the morning again, we had to catch the bus at 9 a.m. our plan was to go to the biggest market called " Lawrence Market " and walk around the city. The market was very crowded. Lots of people were there to buy things. In the market, we saw lots of food that looked very nice. we were planning to have a really good supper so we did not really buy anything there. We came out and started walking around the city. 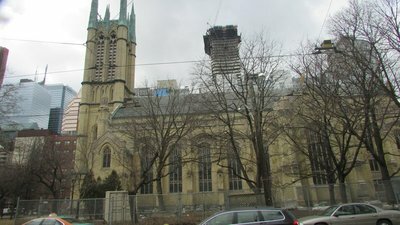 We saw lots of church buildings. They seemed like it took a long time to build them. They were very exquisite classical buildings. After that, my friend's uncle came to pick us up for my friend to get his haircut. We had really good supper, lovely tacos. We were very tired that day because we had to wake up early for a few days and walk so much. We decided to sleep in the next day and take a day off and rest. The next day, my friend and I slept in till 12 p.m. We were so happy that we could rest. We made a good breakfast with the leftover of tacos. We played some play station games and watched some movies. We were still so excited for the rest of the day because we were going to watch Toronto Marlies' hockey game. We headed out to the stadium called Ricoh Coliseum which is Marlies' home rink. There were lots of people that came to watch the game. I do not remember the other team's name and the score but anyway the Marlies won. Everybody was cheering up really hard and I loved the atmosphere very much. I was also in the screen. We came home right after the game and had to go to bed early because we had to wake up earlier than the other days because we had to catch the bus in downtown at 9 to go to Niagara falls. We woke up and were in a hurry because we did not want to miss the bus. We had to catch the bus at 9 a.m in downtown but we got there around 9: 05 a.m. We missed the bus and had to catch another one at 9:30 a.m. It was not that bad but the bus ticket was so much more expensive. The ticket we expected to buy was around 10 dollars round trip for each. But we finally had to buy 50 dollars one each. 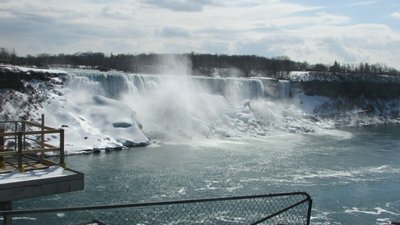 We arrived in Niagara falls around 12 p.m. Firstly we walked to White Water Walk. 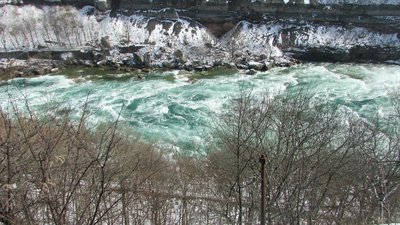 The closest trail was closed for the season but we could see beautiful water flowing. We walked for a bit to go get some subs because we did not have breakfast and were starving. After that, we started walking towards downtown. 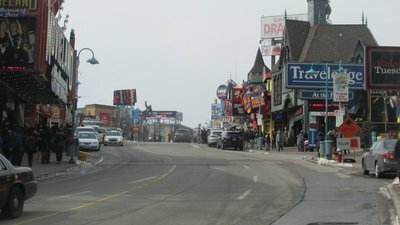 There were lots of game stations on Clifton hill. Lots of people were there as well and they mostly looked like tourists. They had a huge ferris wheel we wanted to ride on. But we could not because It was very expensive. 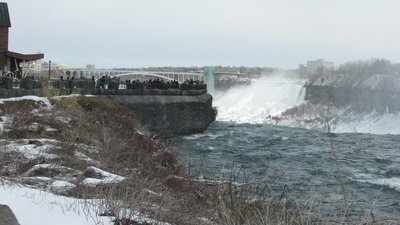 We walked around on the hill a bit and went down to see the falls. 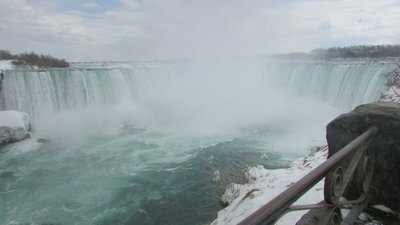 It was my second time seeing the falls but they were really beautiful. 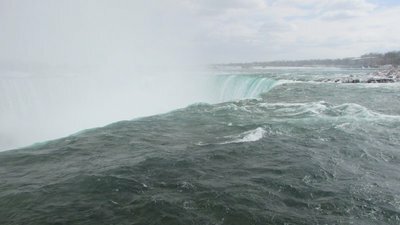 I would never be able to get sick of seeing Niagara falls. There are usually some ships flowing around but it seemed like it was closed for the season. One of the falls had lots of snow on it's rocks so it looked a bit more natural. We stayed there longer because we could not just stop looking at the falls. We walked around very much so we needed to snack. We went back up to the hill and got beaver tail. Beaver tail is always so lovely no matter what. We had to catch a bus back to Toronto around 5:45. We went back to the bus station around 4:50 because we did not want to miss the bus again. Although we were there earlier, we were confused with another bus so we missed it again. It was a little bit frustrating because we made same mistakes twice. 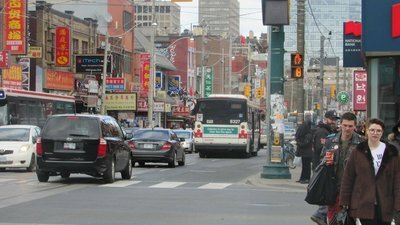 We had to catch another bus at 7:30 p.m and we finally arrived Toronto around 10 p.m. We still had to take subway to get to the bus stop and bus to get home. I still think that it was the best of our trip but it could have been so much better. After we came home, we were very tired but we ate burgers, played play station, watched movies and then went to bed because tomorrow was our last day and we were just planning to have a party at home. 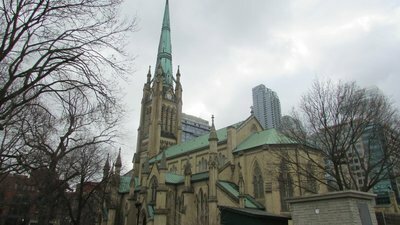 This day was our last day in Toronto. We were tired from the last day so we slept in till 12 p.m. We woke up quite late and had brunch. This day was the day for my friend's uncle. It was the day that he became a Canadian citizen. He told me and my friend that he went to the ceremony, sang the national anthem and stuff. Since it was a great day for him, he wanted to have a party. He invited two of his friends. They were girls that are both from Canada but have background of Thailand and Malaysia. 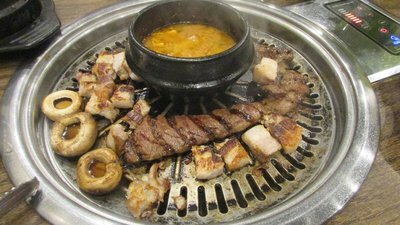 They came and made a really appetizing dish with muscle. I usually do not eat a lot of sea food but their dish was amazing. It was like a bag of chips; if you start, you can't stop easily. And then, my friend's uncle made lovely tacos. We had really good talk until late night. We started feeling bad because it was our last day and the day was like a minute. Though, we wanted to go back home to get rest and see our friends back in Nova Scotia. We did not go to sleep early that night because we had to enjoy the party and we told each other to just sleep in the plane and the whole day when we arrive home. It was such an amazing time in my life. 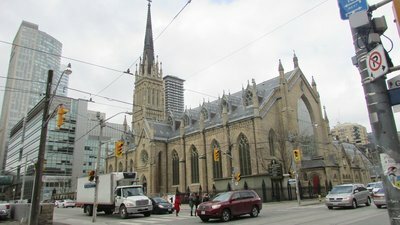 Actually, It was my second time going to Toronto. 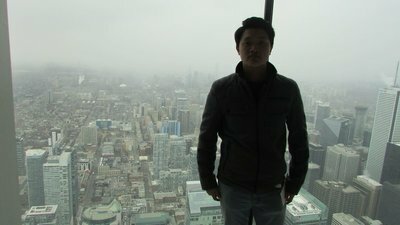 I already visited Toronto with the program 2 years ago. But still, I want to visit again one day. 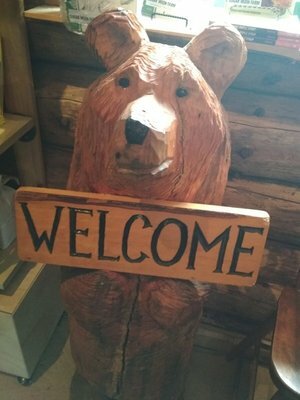 Of course it is definitely a place I recommend people to go enjoy their vacations. I think it is also a really good thing about Nova Scotia that it is really close to those places. 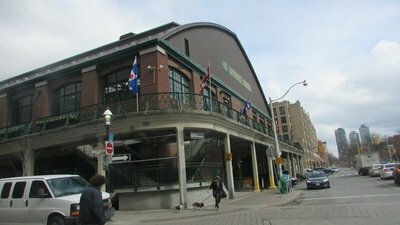 Nova Scotia opens up more options for you to travel around other places in Canada such as Toronto, Montreal, Quebec for vacations. 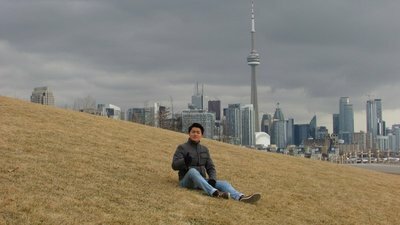 I wish this blog helps those international students that are planning to go visit Toronto for their vacations. 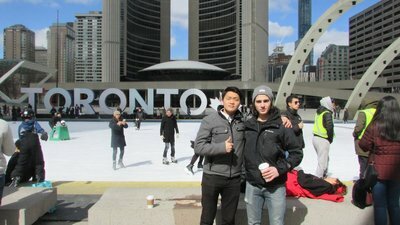 I hope all other international students including foreign correspondents and managers had great march break ! I am coming back with another blog soon. Thank you for reading hope you have a great day today ! Enjoying time with wonderful people and wonderful time. Hello, everyone, my name is Tony, and I'm one of the Nova Scotia's foreign correspondent, and today I would like to share my experiences. From the cold winter and frozen ice, with lots of fun on the field with friends, having a snowball fight and a fun slide down the hill, I was found myself so cherry to have such fun. 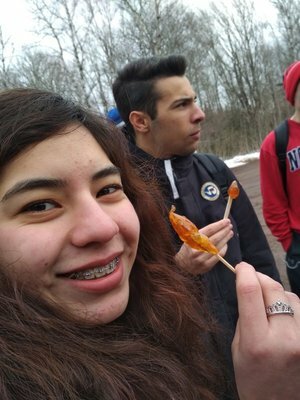 It was during the March Break when my host family decided to travel to Cuba for their vacation, I was transferred to another host family in order to have someone look after me. 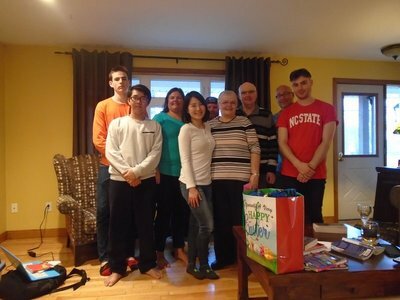 Couple of weeks before the break, I have received a letter from my host coordinator that I was chosen to stay at the Wheller's house, I was excited to see them because they also hosted three international students, which all of them are my close friend. 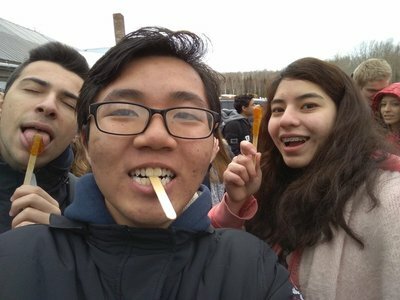 In the last day of school before March Break, I was really happy to stay with them during the March Break, get to hang out with my buds, knowing new people and having fun. 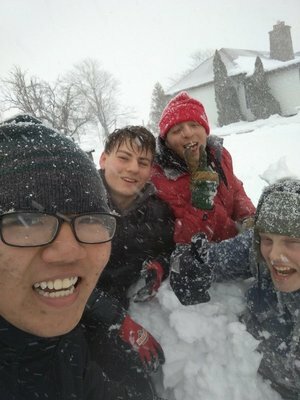 The days on March Break was amazing, I have done lots of things like go filled woods, go sliding down the hill, making a snowman, and I also have a boxing teaching lessons, for free. 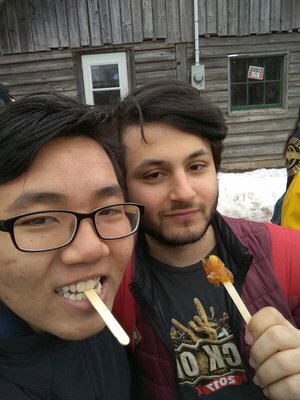 I was able to make many memories that I have with my friends during March Break, playing with them and get to know the guys were awesome. After the amazing and memorable March Break, it was the time for the lovely spring to come, well, sort of. Winter came for a few short days but after that, it didn't. During a few weeks till the end of March, there was a playoff season tournament between the hockey teams. 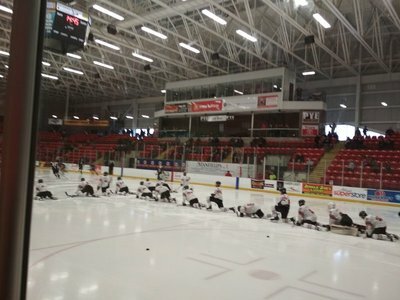 Our Truro's BearCats were fire, their effort, and great teamwork, they were able to make it to the 6th round of the playoff season, but sadly they didn't make it to the final round, the team was very excellent in the game and even they didn't promise to the international, they still in many of Truro's fan heart as the best team. 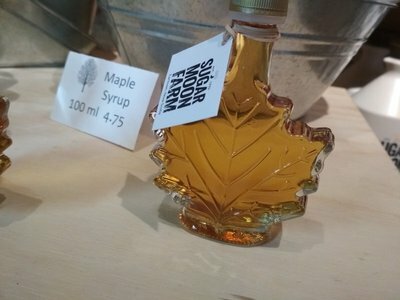 The things that I've heard from all of my Canadian friends is when you are here, in Truro, you must visit the Sugar Moon Farm. The Farm was known for exporting one of the best production sugar, it also known by many of the Canadians in Truro. I and my friends were so excited about this trip, most of us never went to the farm before, even though we'd stayed here for almost eight months. The day has finally come, we're all packed up and ready to roll. 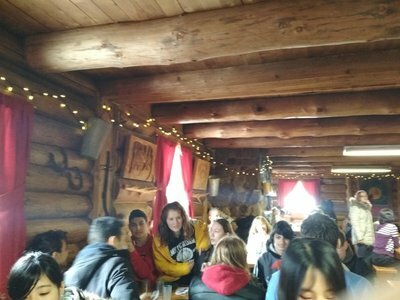 Our international students are gonna go with the life skills students, they were wonderful people, we're all having fun with each other, singing on the bus, laughing, it was a pleasure to have this trip together with them. The trip was wonderful, we went to see the horses couple of walks away from the house, we went to hear an interesting history of the maple tree and how they export it, and it makes me really curious about how the technique and the factors that impact to the maple tree like temperature, wind and depends on how the tree will develop and grow. 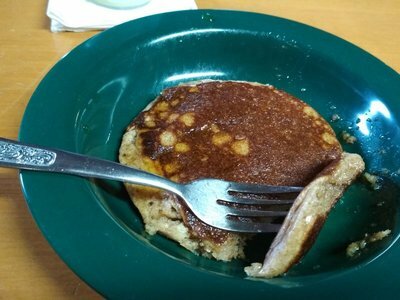 After that, we went to have lunch with delicious pancake, hot out of the pan, and some Sugar Moon Farm amazing syrup, it was a good lunch. 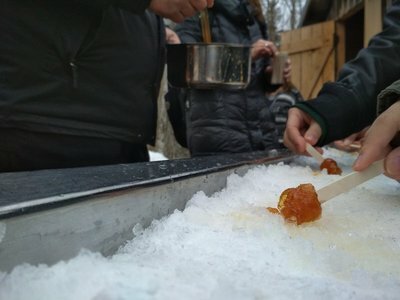 Finally, we're all went out for a break and enjoy a good, cold and sticky dessert, sugar stick, they pour sugar on a surface of ice, we have to take a stick and roll it from bottom to the end. In many countries in Europe or America or North America, there is this traditional culture that I have never experienced before, that is Easter. You know what I'm talking about, the day that kids with their parents and their friends, go into forest or backyard of the house, to look for eggs. Not just ordinary egg is Easter egg with chocolate flavor inside every Easter egg. 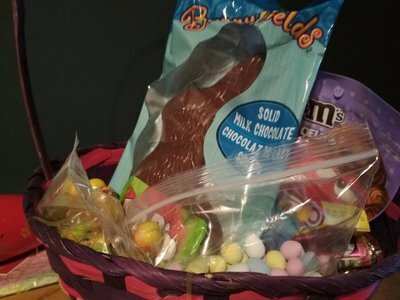 The tradition has been long last for centuries, and so as the legend about the Easter Bunny. I myself was so excited about this because this is my first Easter ever. Our family also arrived with an old member, her name was Ms. Kim from Korea. Having her around, we would never lose our laugh, she was funny and kind and also skills in cooking. We all have a big supper together on the night before Ms. Kim 's flight, there was all member of the family, grandpa, grandma, and my host brother big brother, too, and his friend. Together we eat with joy and laughter, the food was great, the dessert was delicious, everything seems to be better when you have so much happy and warm feelings around you. 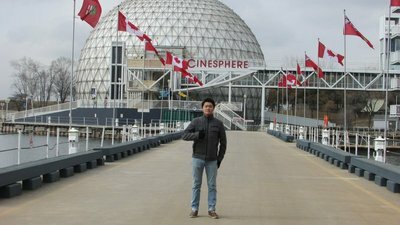 Times went by really fast, it's been eight months since I arrived here, in Canada. I have captured many of great moments with my host family, my friends, this whole new life has changed me, to be a better person, to be more acknowledge about myself, to be more responsible, to be more kind and to be happier, more smiles, and more laughter. Thank you for everything NSISP.